With St. Patrick's Day just around the corner, there's no better way to ring in the Irish holiday than with the sounds of Celtic Thunder. 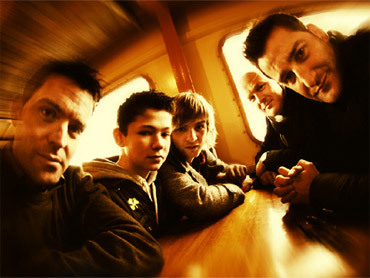 The group is made up of six male vocalists who hail from Ireland and Scotland and range in age from 17 to 40. They are Paul Byrom, George Donaldson, Keith Harkin, Ryan Kelly, Damian McGinty and Neil Byrne. The talented singers use their age difference to their advantage by covering six musical decades, thus drawing fans of all ages. They also pay homage to fellow Irish artists U2 by putting their own, authentic spin on the band's classic song, "Still Haven't Found What I'm Looking For." The lively group stopped by The Early Show Saturday Edition"'s Second Cup Cafe to perform "Still Haven't Found What I'm Looking For" and "Take Me Home" from their recent album, "It's Entertainment!" "It's Entertainment!" also includes hit songs such as Bryan Adams' "Everything I Do" and Leonard Cohen's "Hallelujah." Celtic Thunder made some "thunder" of their own with a stellar year in 2009 -- they were named Billboard's Top World Album/Artist. Since 2007, Celtic Thunder knows how to put on a good show, from powerful ensemble numbers to more intimate solos, highlighting each member's vocal style and personality.